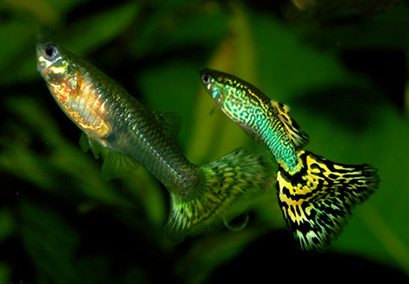 Guppy pair (female on left) [image thanks to Wikipedia]. They have a typical length of 3 to 6 cm, and are easy to maintain and breed. There are a large number of species and varieties, many brightly colored. They are the most common aquarium fish. Killifish [image thanks to Wikipedia]; live in fresh and brackish water over most of the earth, and are common in North American streams and lagoons. There are over 1200 species, some with brilliant colors. With a typical length of 3 to 15 cm, they are only slightly larger than guppies, and seldom eat them. The name "killi" comes from the Dutch "kilde" (small creek), not from the English verb "kill". Cichlid [image thanks to Wikipedia]; I'm not sure this image looks exactly like the cichlids in the river, but it gives you an idea of a common body plan for this group of fish. They are larger than guppies and eat them. This month's essay was motivated by the article: The Great Guppy Experiment . Although guppies live in fresh, not sea water, and are thus not part of Life on the Dock, the work is interesting and important, and clearly relevant to the animals and plants of the Dock. The stream is the Taylor River, in Trinidad and Tobago, an island about 30 km in diameter, 30 km off the coast of Venezuela. Portions of the river consist of segments of gentle flow, separated by falls. The small fish living in the river are unable to transverse the larger falls, and thus these segments represent isolated environments. Guppies are the study animals. They are 3-6 cm long. A female produces 5-30 young (fry) in 28 days, and is able to breed again within hours. Thus there can be 3-4 generations per year. 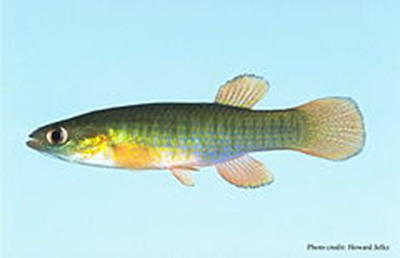 Killifish are often neighbors of the guppies. They are slighty larger but only occasionally eat guppies. Cichlids are the main predator of guppies (and killifish) in the river. This is a very diverse group, with sizes from 3 to 100 cm (1 meter, or a yard). 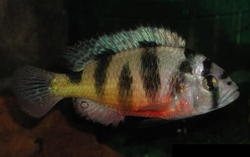 Some cichlids have a flat body, e.g. angelfish, others are cylindrical in shape. Tilapia, which are an important human food, are cichlids. Cichlids also grow and reproduce rapidly, and have been the subject of many studies of evolution. In some river segments there are no guppies, and the researchers introduce 40 males and 40 females. Individual fish are "tatooed" by inserting tiny colored discs of plastic under the skin. They use 12 colors, and there are 8 different possible sites of injection; thus all the founders in a river segment can be uniquely marked. A single scale from a guppy contains sufficient DNA to easily obtain the nucleotide sequence of the fish. Thus it is possible to determine the parents of the new guppies that are produced and thus to determine the reproductive success of families. Many results are clear after a decade of work. Relative to guppies in upper isolated river segments, guppies in lower segments that contain cichlids, have a dull color, reproduce fast, and mature at a small size. When the guppies from lower segments are transplanted to upper ones, they aquire the characteristics of the upper guppies in just a few years. These are genetic changes, not reversible adaptations. Thus we are observing evolution in real time. Many aspects of the environment have been documented during this study, e.g. effects of tree cover, insect populations, water velocity etc. These river segments thus combine many of the desirable characteristics of laboratory and wild environments. While some studies of this system were started several decades ago, the work described in the reference below(which is not a scientific report, but rather a news summary of the status of the project) was initiated in 2006, with a buget of $5 million. It now seems that there will be no more funding. This seems a false saving, since a large data base of observations has been created. The results described in the preceeding paragraph is just a small sample of what can be obtained by examining the data, many more results are sure to be obtained in subsequent publications. However, the value of the project would most likely be increased considerabley is it were to be extended another decade. Unfortunately this article is not "open access", so you must have a subscription to Science, or access to a library that has one, or wait 6 months after the publication date to get access to the entire contents.